Customers can find Service Hub under the Service drop down in the new nav. Service Hub is a new paid product line, learn more about the features here and pricing here. Conversations: The first tool you’ll see in Service Hub is conversations, a universal inbox that helps all teams collaborate on customer support at scale. Conversations can be the new home base for your whole team's communications; including customer conversations. It's built on the HubSpot CRM, so it’s rich with context about who you're talking to and what you know about them from a marketing, sales, and service standpoint. 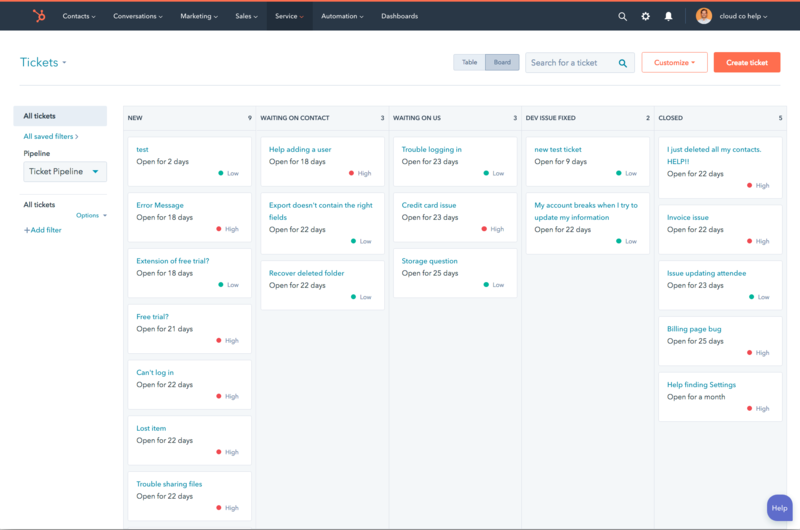 Tickets: Tickets, a new CRM object, offers a way to track, order, collaborate, and deliver on customers’ needs and expectations. The ticket object can be associated with a contact, so all your teams will be able to see if a customer has an open issue. Tickets also come together to form a ticket board in Service Hub. The ticket board is a new home base for your support team. 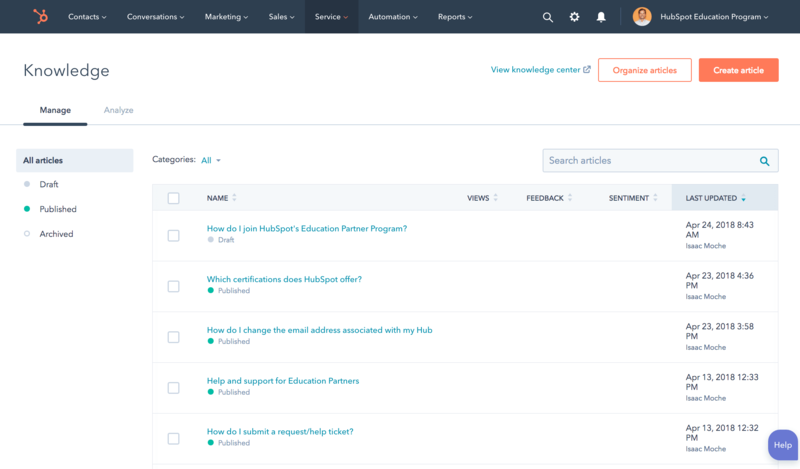 With the knowledge base, you can quickly create articles, make sure they rank on Google, and see valuable insights on a reporting dashboard that tells you how good a given article is at solving customers' issues and deflecting tickets. 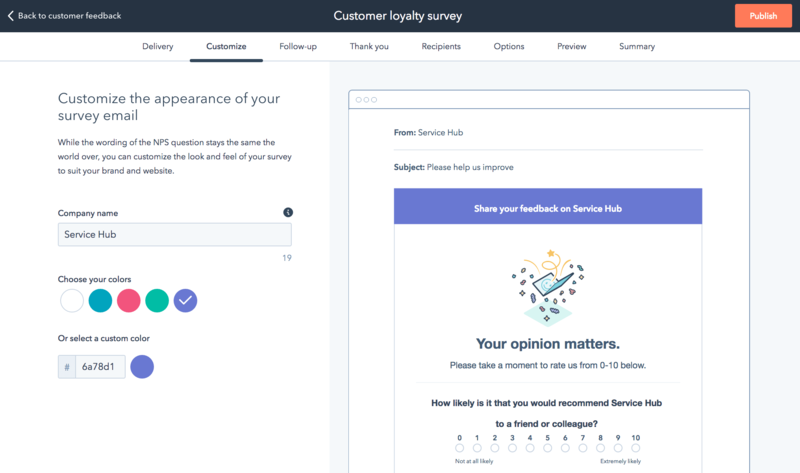 Customer feedback starts with a series of surveys, that you can use to routinely capture qualitative and quantitative feedback from your customers. This can be as simple as a yes-or-no question related to a support experience or a 20-question annual Net Promoter Score® (NPS) survey. With data flowing in on customer happiness you’ll also start to figure out who your biggest promoters are. Use that information to build customer marketing campaigns that help these customers tell the world about your product or service. Service Hub comes with a dedicated reporting dashboard. You’ll be able to measure and monitor ticket data, customer happiness, knowledge article results and much more. Ticket Automation and help desk. Service Hub is features rich automation platform capabilities. You’ll be able to automate ticket creation and build a help that can help customers get answers.